Cooking with the sun is not only eco-friendly, it also contributes to better tasting, more nutritious food. Preparing food in this way encourages energy independence for both developing countries and industrialized nations alike. In areas of the world where disease is on the rise and fuel is in short supply, economical sun cookers are a workable solution. In many impoverished countries, simply cooking a daily meal can be a challenge. For rural communities, electricity and gas are prohibitively expensive, leaving charcoal and firewood as the only alternative. Many times, wood is the single affordable option because it is free. Unfortunately, it is also in short supply. Since burning wood releases vast amounts of carbon dioxide into the atmosphere, health issues arise for those exposed and global warming is aggravated. Often, people use indoor fires to cook and inhale the micro-particles found in smoke, leading to lung and heart disease. It is estimated that 1.5 million people die from this type of air pollution each year. Furthermore, due to scarcity, wood is used for cooking but not sterilizing water. As contaminated water is a problem for over 1 billion people around the world, pasteurizing water is crucial to prevent disease. 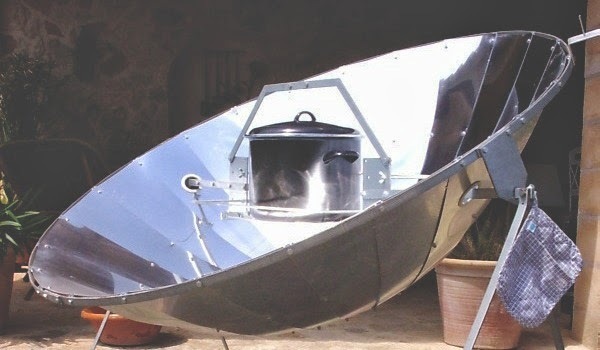 A solar cooker made from basic components provides a solution to many fuel and subsequent health problems. A deflector made from cardboard and foil concentrates the suns energy. It is positioned around a container filled with food or water. A black pot with a glass lid effectively traps heat and energy, cooking food within several hours. Food is pasteurized at 180F while water is pasteurized at 150F. A simple sun cooker, which can be made for as little as $10, can easily reach these temperatures. Pre-made solar cookers are available for purchase, but the simplicity of a few readily available materials is crucial for wide-spread success in developing countries. Since petroleum based fuels such as kerosene and natural gas are taxing to the ecosystem, solar cookers are an energy-savvy choice for industrialized nations too. Utilizing energy from the sun not only makes sense environmentally, but also economically. Utility bills are reduced by tapping into this free, clean source of energy. Proponents of solar cooking also claim that the food simply tastes better. With this slow-cooking method, flavors have time to develop and deepen. More nutrients are retained compared to microwaving, grilling, or frying. cooked, clarity of day, and how often the deflector is moved to follow the sun. Solar cooking does not work in cloudy weather or when temperatures drop below 40F. High altitudes with clear, moderate weather are ideal. Most deflectors need to be secured in windy weather. Use as little water as possible to ensure maximum cooking temperature is reached.